Ed Turner was staying in patient housing provided by Cancer Treatment Centers of America, feeling weak, tired and anxious about what he was facing. After years of remission from kidney cancer, the disease had returned, this time in his liver. The Elkton, Virginia, resident’s white blood cell count soared; he had an infection and felt too sick to even talk to family. When Cynthia Ingram, a registered nurse and animal therapy coordinator at CTCA, brought therapy dog Tori to visit Turner and his wife, Michelle, at their guest quarters, Turner was touched. “She didn’t have to do that,” the 61-year-old says, his voice breaking up. The visit from old friends Cindy and Tori took his mind off his worries. “I was apprehensive about when we could go home and not knowing what the future was,” Turner says. Michelle Turner called Tori a “welcome distraction.” Seeing the joy Tori brought her husband gave them both comfort. Tori is part of the couple’s support system, she says, and lifts their spirits. Animal-assisted therapy involves a trained volunteer or staff member and his or her trained animal—usually a dog—visiting cancer patients while they’re in the hospital or chemotherapy infusion center or awaiting radiation treatments. Home visits to patients are much less common, and must be arranged by a host organization, such as a hospital or a hospice group. The method falls under the larger umbrella of animal-assisted intervention, a goal-oriented intervention that includes animals incorporated into health, education and human service work to provide therapy to people, according to the International Association of Human Animal Interaction Organizations. For people who have cancer, the visits can be as brief as a stop by their hospital-room doorways to say hello, or the therapy dog can rest his head in a patient’s lap for 20 minutes. Within the organization Pet Partners, some 94 percent of therapy animals are dogs, but other therapy animals include cats, miniature horses, rabbits, rats, guinea pigs, potbellied pigs, birds and even llamas and alpacas, says Mary Margaret Callahan, the group’s senior national director for program development. When it comes to dogs, there is no single breed that is used for therapy visits; it’s often more about the individual dog’s personality, say the leaders of several animal-assisted therapy groups. For years, patients and animal-assisted intervention handlers have reported boosts to patient and caregiver moods after visits from therapy animals. That idea was supported by a 2015 study, conducted by researchers at the Continuum Cancer Center at Beth Israel Medical Center in New York and published in the Journal of Community & Supportive Oncology, that shows that animal-assisted therapy has measurable benefits. Thirty-seven patients with head and neck cancers visited by therapy animals reported feeling better socially and emotionally, even as their bodies felt sicker while receiving combined chemotherapy-radiation treatment, the study shows. Visits from the therapy dogs motivated people to come in for their treatments, regardless of how sick they were feeling, Fleishman adds. “Some people said, ‘I would have stopped coming, but I came because I knew the dog and volunteer would be waiting for me,’” he says. Typically, volunteer handlers and their dogs have set days and time periods for visits, so patients get to know a therapy team. Patients in the study said they looked forward to their meetings with the team because they felt the dog was loving them and that they were supported, Fleishman says. However, he adds, the study could not conclude whether the animal therapy had any long-term impact on the patients’ health. Funded through a grant from The Good Dog Foundation and Pfizer Animal Health (now Zoetis Animal Health) the study was not randomized because only patients who like dogs and agreed to receive visits from Good Dog Foundation volunteer handlers and their dogs were enrolled. A review of all the studies on animal-assisted therapy up until 2004 shows moderate improvements in outcomes for some specific groups, according to a 2007 report published in Anthrozoos, a scholarly journal concerned with human/animal interactions that was formerly published by Delta Society and is now published by the International Society for Anthrozoology. Janelle Nimer and psychologist/social worker Brad Lundahl conducted the review of 250 studies of animal-assisted therapy serving a variety of groups, including those who are autistic and those with medical conditions or behavioral or emotional problems. The researchers concluded that 49 of the studies met their criteria for closer analysis. One of those studies found pediatric cancer patients receiving chemotherapy, who also received animal-assisted therapy, reported decreased stress, decreased anxiety and improved quality of life, says Nimer, a licensed clinical social worker who holds a doctorate in veterinary social work. She is president and co-founder of the Animal-Assisted Healing Center in Murray, Utah, and a researcher and clinical assistant professor with the University of Utah College of Social Work. The animals “distracted them and helped them not get as sick when they were getting chemotherapy,” she says. There has been extensive research on the ability of animals to reduce stress in humans, and research shows that cancer patients and their loved ones experience high levels of stress and its effects, including insomnia, weight gain, anxiety and depression. While therapy dog programs are common in hospitals throughout the United States, more research is needed before drawing conclusions on the long-term benefits of animal-assisted therapy and intervention. There is also a lack of scientific research on how animal-assisted therapy may impact therapy animals. Anecdotally, handlers say their dogs enjoy the experience and seem to sense what patients need. How Are Handlers and Animals Screened, Trained and Monitored? Within the United States, there are more than a dozen organizations registered with the International Association of Human-Animal Interaction Organizations (IAHAIO). Each organization, says Pet Partners’ Callahan, establishes its own criteria for how to screen and train people and animals to provide animal-assisted interventions. There is a great deal of variance in how therapy teams are vetted, Callahan says, so she suggests that the institutions hiring or engaged with animal therapy teams adopt a “buyer beware” mindset and check that the teams have comprehensive liability insurance. Animals must receive annual checkups and shots, and handlers have to provide written proof that their animals are healthy. Pet Partners, Caring Critters and The Good Dog Foundation require animals to be bathed, and to have their nails clipped and teeth and coats brushed, on the days they visit patients. Fleishman, who is semi-retired and visits hospitals around the country as part of their accreditation review, says quality control varies by organization. Kathleen Bouchillon, a retired advanced practice registered nurse and vice president of Houston-based Caring Critters, says her organization’s temperament test includes seeing how an animal reacts to an angry stranger who shouts, “Get that dog away from me!” After animals pass the temperament test, they’re on probation for six months. Meanwhile, at the Animal-Assisted Healing Center, once potential therapy animals pass the temperament test, their screening involves proving that they can stay calm and in control when in a room with other animals; can follow basic commands to sit, stay and lie down; and are comfortable accepting hugs and petting in unconventional ways, since some patients may have challenges to their motor skills, Nimer says. As part of the therapy animals’ training through various animal-assisted therapy groups, they are exposed to loud, sudden noises, rides in elevators and people who use wheelchairs, walkers, IV poles or oxygen, say group leaders. Medical facilities vary widely in how they manage therapy animals. While Cynthia Ingram is part of the integrative medicine staff at the Cancer Treatment Centers of America’s suburban Chicago facility, most other therapy animal handlers are volunteers who are vetted by nonprofit organizations, such as Pet Partners, that have contracts with medical facilities. The Good Dog Foundation’s volunteer handler and dog teams visit about 300 medical facilities in Connecticut, Massachusetts, New Jersey, and New York, where the organization is headquartered. While Good Dog Foundation founder Rachel McPherson says animal-assisted therapy teams are on most floors of Memorial Sloan Kettering Cancer Center in New York, MD Anderson Cancer Center only allows Caring Critters’ therapy animals to visit pediatric oncology patients, and only on doctors’ orders. Patients are asked whether they want to be visited by a therapy animal, and, depending on their comfort level, they can pet, play with, snuggle with or simply observe the animal. The main function of the visits is to help reduce stress and boost patients’ moods. 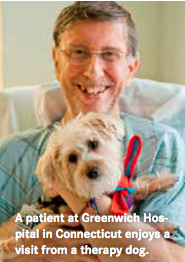 Before Murray receives a chemotherapy infusion at Greenwich Hospital, therapy dog Pippa lays on her lap. Murray pets her for about 10 minutes while her arm is wrapped in a heat pack to help bring her veins to the surface. Generally, people with dog allergies shouldn’t receive visits from therapy dogs, but there are exceptions. For example, Ingram’s therapy dog is an Australian labradoodle that doesn’t shed, so that even some with dog allergies can tolerate Tori. Cancer patients should check with their oncologists before receiving animal-assisted interventions. Patients with low white blood cell counts, infection control issues, fear or dislike of animals and some psychiatric disorders are not good candidates for therapy animal visits. Also, children whose parents or caregivers have an aversion to animals or who are allergic should avoid these visits, says Nimer. Handlers apply hand sanitizer to their own hands and patients’ hands before and after each visit, to protect both the patient and the animal. Handlers also put a clean towel on top of a patient’s lap or chest before placing the dog on the patient (and this is only done with the patient’s permission). Most health insurance doesn’t cover animal-assisted intervention, but it is usually offered free to patients because most handlers are volunteers. While Cancer Treatment Centers of America uses a full-time holistic nurse, because the service is one of several forms of integrative oncology services the hospital provides alongside conventional treatment, animal-assisted therapy there is also free, says Ingram. In addition, the nonprofit organizations that supply the volunteer handlers and animals provide liability insurance coverage through organizational fundraising. Cancer patients and their families often learn of the option of animal-assisted intervention during new-patient orientation. While there’s no central location that allows people to search for which treatment centers offer animal-assisted intervention, many centers provide it to patients who request it. Therapy animal handlers say they limit their animals’ therapy visits to one to two hours per day, and that they monitor their animals for signs of fatigue. Ingram brings Tori to work every day, but the dog naps or hangs out in her handler’s office while Ingram does her other work. Each day, Ingram gets an animal therapy eligibility list of inpatients who are medically cleared to have a visit from Tori. “I walk up and down the hall, we knock on the door and we ask if they’d like a visit from Tori and me,” she says. They’ll visit for a couple of minutes up to about 20 minutes, depending on the patient’s interest. “Tori does provide a lot of stress relief and a lot of comfort,” says Ingram, and not only to patients. The therapy animals also help staff members to cope with the emotional intensity of caring for cancer patients. Therapy animals often help family members as much as they do patients. Tori visited a young patient in the ICU who was at the end stage of life and not very responsive.